REVIV, a company founded in 2010 specializing in wellness IV infusions and vitamin booster shots to feel healthy, energized, and hydrated now has a location in the King West Village neighborhood of Toronto. The company offers a selection five different IV drips and four vitamin injections. 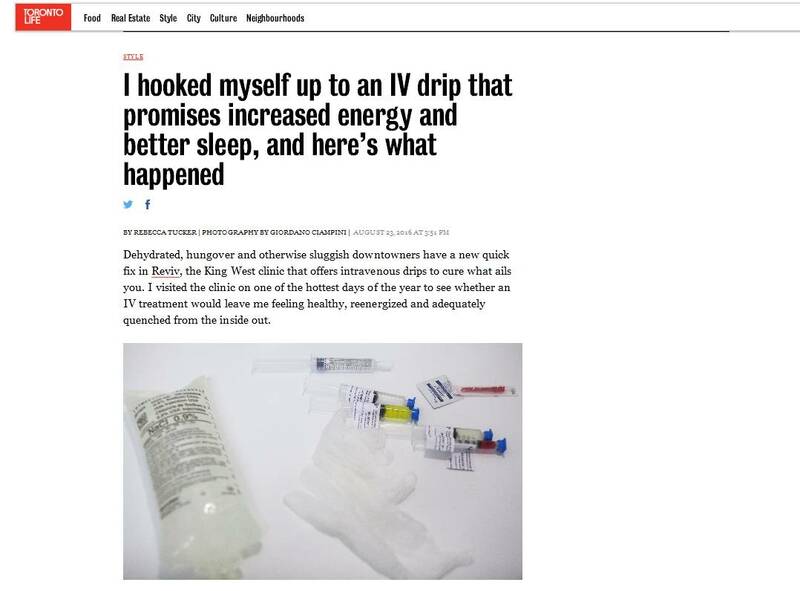 The IV offerings range from recovery infusions containing medications for nausea, pain, and heartburn in addition to the fluids to wellness infusions that do not contain medications but are packed with vitamins like B complex and vitamin C, trace minerals, antioxidants like glutathione, and electrolytes. The booster shot selection includes popular B12 shots, slim boost injections in addition to glutathione and Coenzyme Q10 (CoQ10). The consult consisted on a brief examination from a registered nurse and a Skype consultation with the clinics medical director. The procedure was enjoyable in the white spa atmosphere REVIVhas created in King West Village and the patient felt health, hydrated, and energetic enough to conquer the brutal conditions of the Toronto heat wave.